Someone turn on the lights! With Friday’s gloom/doom gray skies and pouring rain, ducking into the Hop Scotch festival in Fremont seemed like a fine idea. It’s kitty-corner to Brouwer’s Cafe, where many festival attendees were also pre-charging up with some food and beers. It had been three years since my first time attending Hop Scotch and I was up for a revisit after winning tickets from 99 Bottles (thanks guys). I knew what I was in for: very few actual brewers on hand and nothing too rare on tap but enough choices to be happy with. After browsing over the list of beers, there were still some yet-to-be-tried beers to be had. I went for tastes of Alaskan Imperial IPA, Diamond Knot Slane’s Irish Red, Kona Koko Brown, Nectar IPA and some old tried n’ trues, like Lagunitas Brown Shugga & Silver City Whoop Pass. One of the things that sets Hop Scotch apart from other Seattle beer festivals is its decidedly younger crowd. There are less utilikilts and t-shirts tucked into old man pants and more fashion conscious women in knee-high boots along with their properly-groomed dudes. Because it takes place in Fremont, it’s akin to the crowd at Fremont Oktoberfest but not quite so rowdy (at least not while I was there). It does goes til midnight so who knows what the douche factor could be like by then. My single beef was how dark it was inside. The only illumination was cool blue lights & picture projections cast against the walls. Because of the crappy weather outside, I was hoping for brighter, livelier illumination like my last Hop Scotch visit. 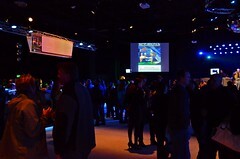 Instead, the organizers chose a subdued, club-like vibe instead. Too bad the music was decidedly uncool with tired cuts from Nirvana, Modest Mouse, Coldplay, etc….